Are you trying to pursue a sales career? Are you already working in sales but having problems hitting your quotas? 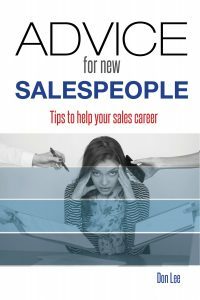 Are you unsure if you made the right career decision by working as a sales professional? If you answered yes to any of these questions, my book will help you. While many recent college graduates and mid-life professionals are entering sales in growing numbers, many are not fully prepared for the challenges of the job. I will help you by focusing on the basics. For example, I discuss how to determine the best type of company for you to work for, outline the pros and cons of working under different compensation packages, provide questions you need to ask during job interviews, and much more. I offer you no promises or silver bullets. Instead, I give you no nonsense advice on how you can be successful in sales. FREE from December 19 through December 23, 2017.